Hello my lovelies and welcome to my brand new fashion post! I am very happy to share with you today a post with one of my favorite topics that I am sure you fashionistas will be very interested in as you always are at this time of year. Winter is coming fast and we all need to get fashionable and chic with our clothes and shoes for the upcoming season. That is why I am here to help you pick out popular items and refresh your wardrobe before the new season begins! Today I will be telling you a bit more about a new online store that I recently discovered called Chicgostyle. It is an online corner where you can check out all the latest trends in one place. Their offer ranges from tops and skirts, over shoes and accessories all the way to sweaters and women's outerwear. Quality is very nice and prices are affordable so you can stay on your budget. I picked out a few of my favorites as I always do to share with you in this post. First of my picks is gorgeous fur coat that I feel in love with. It's so luxurious and so trendy for the upcoming winter. It comes in so many different colors to suit everyone's taste. Second item I really liked is hooded fur coat that is in very popular color military green. Beside outerwear I there is also some great fashion knitwear that I believe you will also like. 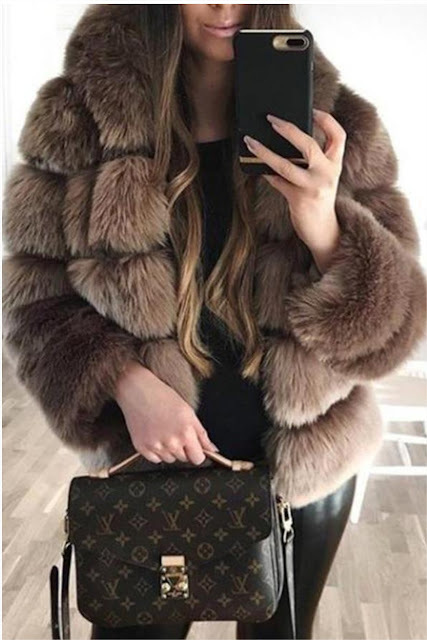 And in case you are looking for a jacket and not a coat, there is also a beautiful jacket with fur that you can check out, it's perfect for transitional period. Let me know what are your favorites from ChicGoStyle my lovelies! I would love to hear your thoughts on trends for the upcoming season! All of these pieces are really beautiful! Definitely a great way to stay warm and stylish.